Awkward introductions are normally the reserve of weddings and dinner parties as the 'plus one' of a proper guest. The virtual world of videogames is where we retreat to avoid these kind of interactions. Thus initial meetings with a new videogame are usually refreshingly straightforward – often following the tried and tested format of... "this is game X: it's a bit like game Y". Or possibly "It is like game Y with elements of game Z". 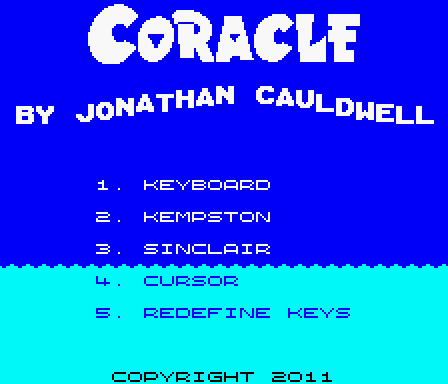 Not so with Jonathan Cauldwell's latest offering Coracle for the ZX Spectrum. From somewhere within his mind yet another new game that is rather difficult to describe has sprung forth. 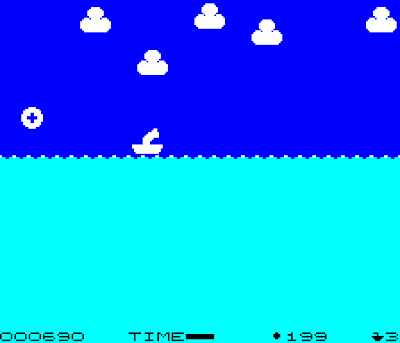 The player controls a boat (the titular Coracle no less), which moves ceaselessly left and right across the top of the ocean. The player has control over the speed – but never stop to or reverse the direction, which happens automatically at the edge of the screen. The boat is equipped with a gun turret that the player controls the angle of, and a limited amount of ammo. This ammo is used to shoot things from the sky – initially clouds - which upon being shot, drop rain which raises the level of the ocean. Accidentally shooting the passing planes (that also fall into the ocean) decreases the ocean level – although I suspect that Archimedes would have something to say about this! Once the sea level is at it's maximum, the clouds are replaced by balls that move through the sky. Shooting these drops sea creatures harmlessly into the ocean – or - and herein lies the point of the game - they can be caught by making sure your boat is underneath when they land – harder than it sounds as you have to manage the speed of the boat, and the angle of the gun. Once sixteen sea creatures are caught, the next level starts. Your task is made more difficult by random junk that needs to be kept from the ocean by being shot from the sky (and avoided with your boat), and the whole thing is played out against a tight timer. Bonuses come in the form of special items to shoot and catch and points are awarded for having caught fourteen or more of the same type of sea creature at the end of a level. The look of the game is clean (like an early Ultimate game) and the game play similarly arbitrary - Cookie springs to mind, if you simply must have something to compare to. Keys are re-definable, and the menu has a nice musical ditty (and contains the instructions – which is helpful as you'd be some time guessing them I suspect). So, generally the gloss levels are very high. 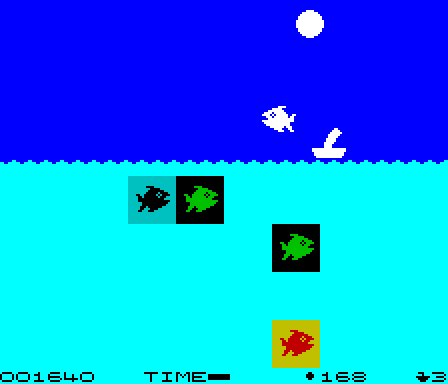 The game is not quite perfect however – an occasional attribute glitch in the sea can be introduced (by shooting a piece of junk at the last possible moment before it enters the water) and the game can slightly outstay its welcome – especially when waiting for the timer to run down after you've run out of ammo. In spite of the minor criticisms this is a rather entertaining distraction – and almost certainly a different game to those you are used to playing. It is difficult to recommend it to a particular audience (the cliché of "Fans of game X should check this out" is not relevant when the reviewed game has no obvious ancestry) - but the recommendation still holds.... It might just be the classic game you never knew you loved! (Coracle is available to buy from Cronosoft on cassette for £3.99). Download the game here (from the World of Spectrum site). (Simon Ullyatt from Cronosoft, who have published Coracle on cassette took some time out to speak to RGCD). For readers who are not familiar with yourself and Cronosoft, could you explain who you are? I'm a 40 year old retro gamer, that decided in 2002 to set up a software house/label to publish games, either old released ones, or newly created games as they would have been done in the golden era of gaming; Games for the Spectrum, Commodore 64, Amstrad etc., on cassette with full coloured inlay and artwork. We publish the games as a non-profit making label, but do pay the authors a royalty for each copy sold. Publishing for commercially expired systems seems deliberately perverse, why do you think it is important that this is done at this time? We do it for a couple of reasons. Firstly, it adds value (in terms of appreciation) to people that go to the trouble of writing new games. When I say that, I mean that a freely downloadable emulator image of a game isn't going to receive the same amount of appreciation from the gaming community as one that comes in brand new packaging, that they've bought, wait for it to load, play and then add to their collection. It's a way of trying to recreate the excitement of gaming in a nostalgic way. Secondly, it's hoped that a small contribution in monetary terms (and I mean SMALL!) is a little encouragement for game authors to make more titles, benefiting everyone. Are there any games that you are particularly proud to have brought to market? There have been several titles I really love, many because they have special points, or have referred to certain milestones. Egghead in Space (Spectrum) was our very first 'tester' game. Gamex (Spectrum) was Jonathan Cauldwell's awesome exercise in cramming as many sub-games into one 48K program. Farmer Jack & the Hedge Monkeys (Spectrum) by Bob Smith appeared as a complete surprise, in that I'd mentioned somewhere that I'd love to see a version of the arcade game 'Ladybug' on the Speccy, and it was done! What is your relationship with the software authors? Do you take on an active role through the development? Not at all. Software authors often send me a copy of the game, once it's about 90% or even 100% complete - I often know nothing about it until it's nearly ready. I'd likely to publicly thank everyone who's sent games in to Cronosoft, and given us a chance to put their game out on cassette - without them, there wouldn't be anything for us all to play. Are you actively seeking other authors/systems to publish for? I'd love to publish for other systems. To name a few, I'd love to see games for the TI99/4A, Sord M5, Oric, Mega CD, CD32, and maybe even some cartridge based systems like the Gameboy, Atari 2600 etc. It's also my ambition to get some games written by the original authors of classics. There are so many programmers that I admire like Jeff Minter, Matthew Smith, Sensible Software etc. It was planned a few years ago that Jonathan Smith (Hyper Sports, Cobra etc.) was to release a game with us, called Saucer, that was well into it's advanced stages, but tragically he passed away. And is this the route to untold riches and gold plated mansions? Hell no..! The current bank account has a couple of hundred quid in it, which is there to buy blank tapes and consumables. It's all done on a shoestring budget. You have been publishing on cassette in a gloriously time intensive and D.I.Y. way, have you any plans/thoughts to publish disk/CD material at all? Yes, CD and disk stuff would be quite easy for most systems, and I'd like to do cartridges too, though could probably use a bit of expert assistance. I bought an EEPROM programmer to look into it, though don't really know what I'm doing. How is the actual production done - with short run duplication of tapes being notoriously expensive - or are you doing them by hand? All the tapes are done to order, which is a bit tedious, but tends to work fine most of the time. The tapes are now taken from a CD master in most cases, which speeds things up a bit, plus I have daisy chained tape decks for producing the Speccy tapes. I did pick up an ex home-office duplicator from 'Freecycle' (no expense spared!) which copied a C15 in about 30 seconds, but it didn't blimmin' work reliably enough! Printing inlays is very time consuming, and perhaps the most tedious job and I get through loads of ink cartridges! Having had a particularly dark moment some time ago, where you were considering calling it a day with Cronosoft - is the future now bright again? It's up and down a bit at the moment, sales are quite slow for a few months, and then suddenly they'll pick up for no explainable reason. I'll just keep at it, and see what happens. What is it you like about the retro-gaming scene? The community is great, especially when you get to go to the shows and meet the faces behind the names. Every show I've been too has been fantastic fun - just a shame they're rarely anywhere near us in deepest Lincolnshire :) The World Of Spectrum community has been really supportive of what we do. What should RGCD readers be looking out for next from Cronosoft - any upcoming releases/juicy titbits to tempt us with? Next up on the release agenda are two new Vic 20 titles, THE KEEP (which has been released as a free download, but the tape version is in the pipeline), and GAME THEORY (a multi-sub game item). Also for the ZX81 we have ZINVADERS and VIRUS coming up soon, once we've ironed out a few duplication problems. Also, I hope to re-issue some of the old games that haven't been available for a few years. Is there anything else you'd like to say to RGCD readers?